Extreame Savings Item! 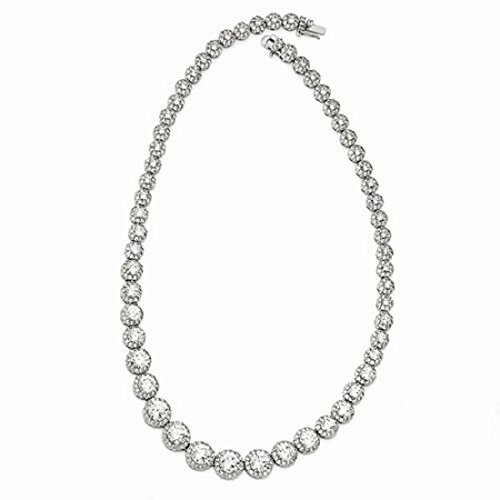 Save 42% on the Cheryl M Halo Journey Fancy CZ Necklace 18'' QCM654 by Cheryl M at Blood of The Young. MPN: QCM654-18. Hurry! Limited time offer. Offer valid only while supplies last. Another beautiful item from the Cheryl M Collection. The Cheryl M Collection features beautiful, top quality items that are both trendy and timeless. Another beautiful item from the Cheryl M Collection. The Cheryl M Collection features beautiful, top quality items that are both trendy and timeless. This gorgeous 18" necklace features beautiful, sparkling CZ's set in halo mountings. The halo's are graduated journey style to create a stunning piece. Matching Bracelets and Earrings available for many of the Cheryl M items. Please see our other listings or contact us for more information. Each Cheryl M Product includes a beautiful Romance Card and an Organza Pouch - perfect for gift giving. We carry the full line of Cheryl M Jewelry including beautiful chandelier jewelry, pins, bracelets, necklaces and earrings. Please visit our Amazon store for our complete product line or contact us with any questions that you might have. Roxx Fine Jewelry is committed to offering top quality jewelry, affordable prices and an outstanding customer service experience. Plus, most items include FREE SHIPPING and we always offer No Hassle 30 Day Returns. You will love shopping with us. If you have any questions about this product by Cheryl M, contact us by completing and submitting the form below. If you are looking for a specif part number, please include it with your message.